Make a way towards the riches with your favorites at Cyber Bingo! We give you an access to the latest offers from Cyber Bingo! Established in 1996, Cyber Bingo is one of the oldest and the most trusted Bingo sites owned by Vista Gaming Bingo Network. Since its origin, it has been successful in maintaining a recognizable position and providing a spectacular gaming experience to the players. Cyber Bingo is powered by Vista Gaming and has its license through Kahnawake Gaming Commission. Encrypted by 128-Bit SSL Protocol, it also provides a secure gaming environment to Bingo maniacs along with a 24/7 customer assistance. This Bingo brand not only offers amazing Bingo games but also renders its services in the domain of Video Slots, Video Poker, Chain Reactors, Table Games, Keno and more. Cyber Bingo also bestows humongous bonuses and promotions on to the players and strives to be the best choice for all Bingo enthusiasts. Cook Islands, Croatia, Cuba, Czech Republic, Djibouti, Dominica, Dominican Republic, Ecuador, Egypt, El Salvador, Equatorial Guinea, Eritrea, Estonia, Ethiopia, Falkland Islands (Malvinas), French Guiana, French Polynesia, French Southern Territories, Gabon, Gambia, Georgia, Ghana, Greenland, Grenada, Guadeloupe, Guam, Guatemala, Guernsey, Guinea-Bissau, Guyana, Haiti, Heard Island And Mcdonald Islands, Honduras, Hungary, India, Indonesia, Iran, Iraq, Isle Of Man, Israel, Jamaica, Jersey, Jordan, Kazakhstan, Kenya, Kiribati, Kuwait, Kyrgyzstan, Laos, Latvia, Lebanon, Lesotho, Liberia, Libya, Lithuania, Macedonia, Madagascar, Malawi, Malaysia, Maldives, Mali, Marshall Islands, Martinique, Mauritania, Mauritius, Mayotte, Micronesia, Moldova, Monaco, Montenegro, Montserrat, Morocco, Mozambique, Myanmar, Nagorno-Karabakh, Namibia, Nauru, New Caledonia, Nicaragua, Niger, Nigeria, Niue, Norfolk Island, North Korea, Northern Mariana Islands, Oman, Pakistan, Palau, Palestine, Panama, Papua New Guinea, Paraguay, Peru, Philippines, Pitcairn, Poland, Qatar, Réunion, Romania, Russia, Rwanda, Saint Barthélemy, Saint Helena, Ascension And Tristan Da Cunha, Saint Kitts And Nevis, Saint Lucia, Saint Martin (French Part), Saint Pierre and Miquelon, Saint Vincent and The Grenadines, Samoa, San Marino, São Tomé And Príncipe, Saudi Arabia, Senegal, Serbia, Seychelles, Sierra Leone, Sint Maarten (Dutch Part), Slovakia, Slovenia, Somalia, South Georgia and The South Sandwich Islands, South Sudan, Spain, Sri Lanka, Sudan, Suriname, Svalbard and Jan Mayen, Swaziland, Syria, Tajikistan, Tanzania, Thailand, Timor-Leste, Togo, Tokelau, Tonga, Trinidad and Tobago, Tunisia, Turkmenistan, Turks and Caicos Islands, Tuvalu, Uganda, Ukraine, United Arab Emirates, United Kingdom, Vanuatu, Venezuela, Wallis and Futuna, Western Sahara, Yemen, Zambia and Zimbabwe. With the mobile casino platform of Cyber Bingo, you can play all your favorites on the go without making strenuous efforts. The players get to enjoy various bingo games, Slots and a number of casino games anywhere and anytime at Cyber Bingo. Its mobile casino is compatible with all mobile devices including android, windows or an ios device. devices including android, windows or an ios device. Cyber Bingo does not provide the service of live dealers. Cyber Bingo is powered by efficient software technologies inclusive of Vista Gaming and Saucify. • Saucify, also known as BetOnSoft is a privately owned company providing coherent gaming to the gaming industry. • Its core focus lies on the casino technology. • Vista Gaming is an award winning platform, introduced in 1996. • It focuses on providing services in the field of Bingo and online casino venture. 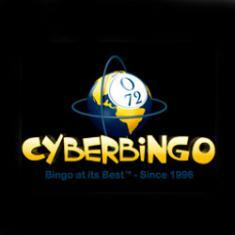 Bingo enthusiasts get to enjoy a wide array of games at Cyber Bingo. This Bingo brand offers numerous bingo games, bingo tournaments and unique bingo events along with impressive jackpots. Halloween Bingo is one of the popular Bingo games offering exciting progressive jackpots at Cyber Bingo. It also offers amazing Slot titles, Blackjack, Roulette, Video Poker, Scratch cards, Keno variants and unique games like chain reactor. Maiden players at Cyber Bingo get to enjoy up to 1500% bonus on making the first three deposits. Depositing $25 for the first time at Cyber Bingo can get you a bonus of 500%, 600% on your 2nd deposit and 400% on your 3rd deposit respectively. The bingo room also bestows 10 free spins on registering with Cyber Bingo. So, hustle up and join Cyber Bingo to enjoy the exciting promotional bonuses. Cyber Bingo exhibits its loyalty towards the players by offering them with exciting loyalty points. You can redeem more points on funding your account with more money on playing your favorites at Cyber Bingo. In the loyalty program, every player gets 15 loyalty points on every dollar he deposits. At Cyber Bingo, you receive special bingo points on every card you purchase. These points can further get you big cash rewards. Daily, weekly and Monthly draws at Cyber Bingo, all can get you exciting rewards! It's important to select a gaming device before starting your journey at Cyber Bingo. You can choose either your desktop screen, tablet, android , windows or an ios device to begin your play. Once you have visited the site, you must become a member at Cyber Bingo by entering the required details. Click on the 'Register' option, enter your details and you become a part of Cyber Bingo. Post creating an account, it is mandatory to make a deposit for continuing at the site. Cyber Bingo accepts a minimum deposit of $25 which then bestows an amazing 500% welcome bonus. Once you are done with the above mentioned steps, you must continue to play your favorites at Cyber Bingo and make a way towards the riches! My friend's neighbour hit a jackpot here. I thought I gotta try. Look pretty heavy stuff. Any recommendation if it worth tryn? So many promotions they hav on them site. Please enter your review for the Cyber Bingo.